Iwata Com-Art Airbrush Colors offer tremendous versatility, superior atomization, and breathtaking results. 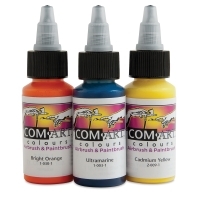 Non-toxic and ready-to-use, Com-Art paints are specially formulated for airbrushing and never need to be filtered or strained. They spray smoothly and resist clogging. Extremely lightfast.